If you purchase the upcoming Baldur's Gate: Enhanced Edition for iPad, you'll get access to multiplayer and 80+ hours of content for less than a faded green portrait of Alexander Hamilton. 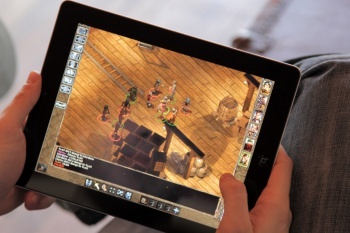 According to a recent interview with Kotaku, Beamdog will sell the iPad version of Baldur's Gate: Enhanced Edition for less than $10, calling any price higher than that just "crazy." But just because the company has cut the game's retail cost, that doesn't mean it's cutting content. "Baldur's Gate is a pretty big game and we're not cutting it down to size," said Cameron Tofer, the Beamdog's chief operating officer. "There's a boatload of content there, 80+ hours. But past ten dollars doesn't make sense." The initial Baldur's Gate iPad release will include all of the enhanced Baldur's Gate, its Tales of the Sword Coast expansion, and whatever additional content Beamdog has been cooking up. A similarly retooled version of the game's sequel, Shadows of Amn will be released sometime after the first. Tofer has also confirmed that the iPad edition of BG:EE will support multiplayer, though details of its specific implementation have yet to be announced. Final pricing for both the iPad and PC edition, as well as what we can expect from the game's multiplayer should be announced in the near(ish) future, as Baldur's Gate: Enhanced Edition is scheduled to arrive for iOS and Steam this summer.